We have 30 photos sets of SEA Youth. To view it, click here. Find out the overall scoring system points and medal tally here. Read Singapore strikes gold at SEA Youth Athletics Championships. The last arrival of the overseas teams to the seventh edition of SEA Youth Athletics Championship arrived Singapore shores earlier today and with that the event proceeded with the technical meeting. Held at 4:30 PM at Downtown East, the respective countries team manager attended the meeting to finalise the nomination of athletes. Not shortly after, the officials and team manager then proceed to adjoining room for the SEA Youth welcome dinner. Attended by the various sponsors, and SEA nations, it was an excellent start to the Championships. 1. Click here to view photos from today’s event. 2. Click here to watch video footage from today’s event. Singapore Athletics Association launches 7th SEA Youth Athletics Championships 2012 booklet. Inside it entails the profile of our young athletes, coaches, and officials for the seventh edition of this event. One can also look up the schedule and competition rules provided in the booklet. Download the booklet in PDF format. 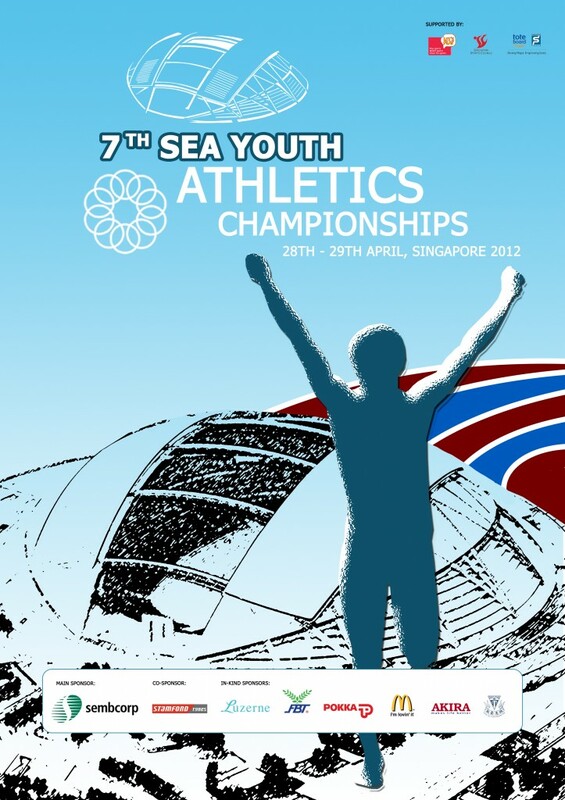 Find out Team Singapore Contingent for 7th SEA Youth Athletics Championships 2012. Find out Straight finals event, no heats for this C’ships. SAA will be conducting a special competition trial for our youth athletes to help them to qualify for 7th SEA Youth Athletics Championships 2012. Read Shot Put, Javelin and Hurdles added to Special Trial for SEA Youth qualification for SEA Youth. Read SAA secures Sembcorp for sponsorship. Read Singapore Youth Team Qualifiers for SEA Youth. Read: U18 Hammer & 1,000m special competition trial at Nat Sch for S’pore Sea Youth Team. In order to be entered in the SEA Youth Championship 2012 competition, an athlete will be required to achieve the appropriate Qualification Standard in the event(s) in which he/she is entered. The Qualification Standards and relevant criteria shall be established by the SAA from 1st November 2011 onwards and will be valid till the final entry submission dead line for all events. – All individual events: 1 November 2011 to 20 April 2012. There are 3 phases during the qualifying period. Any athlete keen to be selected for the said event needs to compete in at least 1 competition from 2 of the 3 phase to be considered eligible. Time/Distance/Height recorded from the events and the athlete’s positioning will be ranked and monitored for consistency in performance throughout the season to be considered for final nomination. If more than 2 athletes per event qualify or if there is a tie, then the final phase competition results will be used for the final nomination. The final number of athletes that will be entered will be based base on the maximum of athletes that can be entered per event in the competition. All performances must be achieved during competitions organised or authorised by the SAA or any SAA sanctioned competitions in conformity with IAAF Rules in the stipulated time frame. Results achieved at university or school competitions will only be accepted if the Meets are sanctioned and certified by the SAA. Performances achieved in mixed events between male and female participants, held completely in the stadium, may be accepted under specific circumstances and conditions (see IAAF Rule 147). Wind-assisted performances will not be accepted. Hand timing performances in 100m, 200m, 400m, 110m/100m Hurdles, 400m Hurdles and 4x100m Relay will not be accepted. Indoor performances for all field events and for races of 400m and longer, will be accepted. For the running events of 400m and over (including combined events), performances achieved on oversized tracks shall not be accepted. The SAA National Juniors Meet is designated to be the final selection for forming all the Sea Youth relay teams. The fastest 6 runners in the finals of the 100m & 400m will be seleted to form the Sea youth Relay Team. SAA reserves the right to hold a 2nd trial prior to the Sea Youth Champs to have another round of selection if it is needed. Note: The U21 events for the SEA Youth U21 for 100m, 200m and 400m is the same for Asian Junior and not all the events.